15th NTRCA Exam Date And Admit Card Download ntrca.teletalk.com.bd NTRCA authority publish 15th ntrca Preliminary & written exam date. Now you can check 15th NTRCA admit card download link ntrca.teletalk.com.bd. NTRCA.TELETALK.COM.BD is the official website link for download 15th Admit Card. 15th NTRCA Preliminary Exam will be held 19 April 2019 (Friday) and 15th NTRCA written exam will be held 26 July 2019 (Friday) for the School, School-2 & 27 July 2019 (Saturday) for the College level. So candidate can download their 15th NTRCA Admit Card ntrca.teletalk.com.bd. 15th NTRCA Job Circular 2018 Teachers Registration exam Syllabus. 15th NTRCA Job circular 2018 for teachers’ registration exam will be published soon. Non-Government Teachers’ Registration & Certification Authority (NTRCA) is inviting applications from candidates who are interested to participate in the 15th NTRCA teachers’ registration exam 2018. 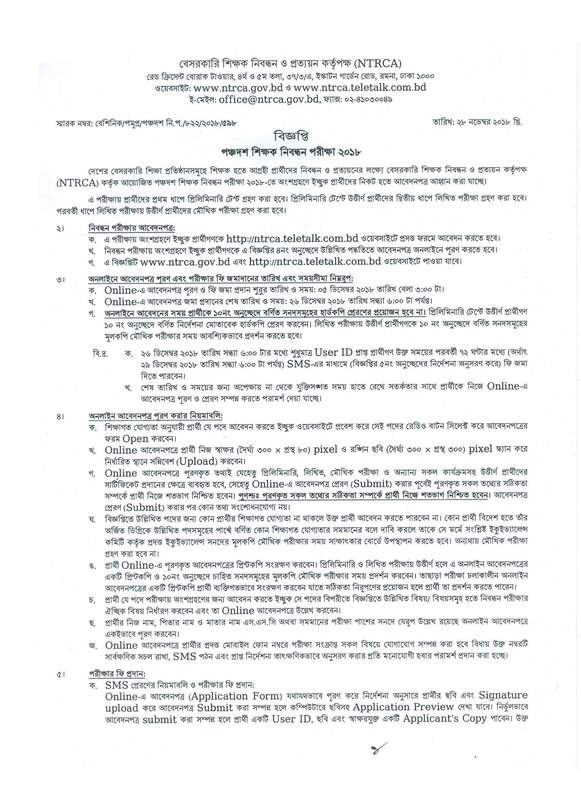 This shikkhok nibondhon 2018 circular is for undergraduate and postgraduate candidates. Non-government Teachers Registration and Certification Authority have taken the steps for an online registration form by Teletalk mobile. The 15th NTRCA teachers registration examination, a pre-qualifying examination to appoint teachers in schools, madrasas, colleges, and technical institutes will be held in February 2019. 15th NTRCA teachers registration Exam Date Announced. NTRCA authority has been published their exam test schedule. NTRCA published their MCQ & Written Exam schedule. You can find NTRCA Exam Schedule by our website. 15th NTRCA Teachers’ Registration Circular, Syllabus 2018. This year 15th NTRCA Teachers’ Registration Circular, Syllabus 2018 has been changed. In previous year candidates had to attend MCQ & written test without any break. But this year candidates get break MCQ & written tests. Last Wednesday this news was found by NTRCA. This news was published by a press release. For educational qualifications examinations, revealed (appeared) candidate’s applications will not be accepted. Recent passed candidates will apply with a testimonial, tabulation sheet/transcript & admit card, which will be approved by the head of the related educational institute. 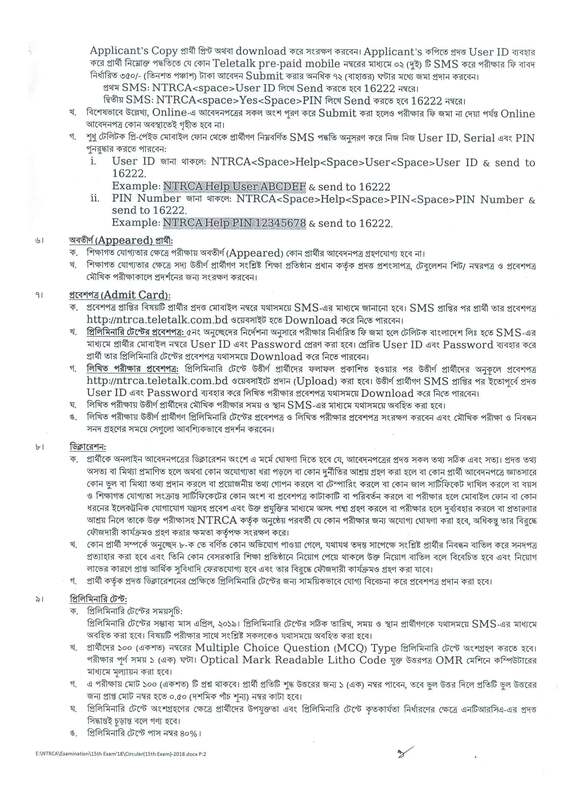 How to Apply for NTRCA Job Circular Registration? 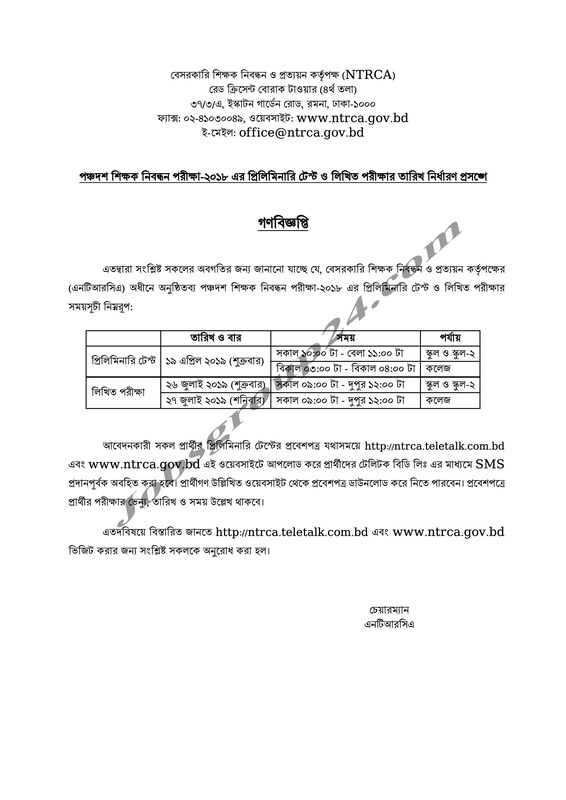 NTRCA online application form fills up the process: To apply 15th teachers registration exam, at first you have to http://ntrca.teletalk.com.bd/ website. And click Apply Online Button. After typing your all information, you need to upload your passport size color photo (300 X 300) Pixel & signature (300 X 80) Pixel. After completing all steps you will press the “Submit” button. But one thing, before application submission pleases be absolutely sure about the accuracy of such information is Filled by the candidate. Applicants should be collected online filled application print Copy for future any help regarding the 15th teacher’s registration exam. To sending the 1st SMS you will get a PIN number, which you will use in 2nd SMS. 15th shikkhok nibondhon 2018 application fee Tk.350/- and after submitting an online application you have to pay the application fee within 72 hours otherwise application would not be accepted. If you have any question about 15th NTRCA Circular Teachers Registration Syllabus 2018 then comment below or you can message us through Facebook page. We will reply as soon as possible. We will update 15th teacher registration exam School Level & College Level Syllabus in our website. Admit Card Collect: for collecting admit card of 15th NTRCA Teachers’ Registration examination interested candidates’ need user ID & password. To download admit card interested candidates have to use user ID & password. So they should keep user ID & password very carefully. We will give you all related update here in time. So, don’t worry to get further about 15th NTRCA Circular, Teachers Registration Syllabus 2018. If you have any question about 15th NTRCA Job Circular 2018 and Teachers Registration exam Syllabus details then comment below or message us through our Facebook page. We will reply as soon as possible.